Looking for a Red Book? I can’t remember the title but it had a red cover….. How do you recall books? – by author’s name, title or by the colour of the cover? This month, in honour of Library Lover’s Day. we have put red books into the spotlight. 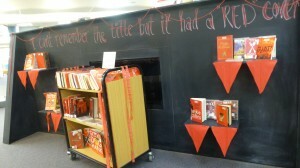 Why not choose your next read from this red hot display!